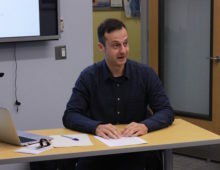 On April 21st, 2017, the Jordan Center for the Advanced Study of Russia welcomed Constantin Katsakioris from the Bayreuth Academy of Advanced African Studies for his talk, entitled “The Patrice Lumumba University in Moscow: Higher Education for a Soviet-Third World Alliance.” Katsakioris was introduced by Yanni Kotsonis of the Department of Russian and Slavic Studies and History at NYU. The paper presented by Katsakioris retraces the history of the Patrice Lumumba Peoples’ Friendship University (UDN in its Russian acronym) from its creation in 1960 until the dissolution of the USSR, when “UDN” was rechristened “RUDN” or Russian Peoples’ Friendship University. Based on archival research, this work is a “spin-off” of his research on educational and cultural cooperation between the Soviet Union and post-colonial countries of Asia and Africa, Katsakioris said, noting that this cooperation is a very important chapter in East-South relations, albeit also a forgotten one save for attention from a handful of scholars. The scope of the educational cooperation between African countries and the Soviet Union is easy to illustrate in numbers, as Katsakioris showed. In 1962, 1,000 students from sub-Saharan Africa studied in the Soviet Union; less than France and the United States. In 1967, 9,000 students from the entire African continent studied in the Eastern Bloc, 5,000 of them in the USSR. This number kept growing within the next decades, even surpassing the UK. By 1988, the Soviet Union hosted 21,000 students from the region, a number higher than in the US. The cooperation between post-colonial countries and the Soviet Union started with the independence of many of these countries, wherein education became central for the project of replacing colonial administrative elites with national ones, Katsakioris explained. A critical moment was in December 1959, two months before Khrushchev announced the establishment of UDN, when a congress took place in what was then still the French Empire, in Dakar and Abidjan. Almost two hundred scholars attended from France, meeting with African politicians and educated elites, and it was at this gathering that Charles de Gaulle announced the independence of Senegal. As the French were leaving the former colonies’ administrative posts, in February 1960, French education scholars published a paper based on the conference proposing an International University in the Service of Under-Developed People. This idea was not received well by African politicians, according Katsakioris, who explained that they saw such a set-up as a further perpetuation of the relationship between the colonizer and the colonized; a separate university just sounded like a colonial school. When Khrushchev announced the creation of the UDN during a visit to Indonesia in 1960, he had the same “modernizing education” rationale as the French, but a crucial (at least to Soviet authorities) difference was that the Soviet Union would aim to host lower income students by providing them with scholarships, Katsakioris said. From 1960 to the end of the USSR, the annual enrollment at UDN was 600 students (25% from Sub-Saharan Africa, 25% from Middle East and North Africa, as well as students from (non-socialist) Asian countries and Latin America). “Everything was great initially,” Katsakioris said, “but the triumph of the Soviets did not last long.” There were criticisms from other governments, as well as exposes from students. In a number of cases, former UDN students were involved in anti-government struggles and terrorism in their home countries. “There are often parallels drawn [by organizations like the CIA] between the Lumumba University and the Qum University in Iran, where radical clerics are educated that were very prominent in the Iranian Revolution,” Katsakioris pointed out. In the beginning, Katsakioris said, only ten percent of the students was from the Soviet Union; the rest were from the Third World. Almost all students were on scholarships that covered accommodation, and received a stipend that would go towards daily expenditures. Although the curriculum was determined by the Soviet ministry of education, the university was funded and managed by so called “social organizations.” Another particularity of the Lumumba University, Katsakioris said, was that it practiced affirmative action “to bring in students of working class and peasant background,” as well as admit students who hadn’t completed secondary education. As far as international views and reactions were concerned, Katsakioris talked about the many reactions of African students “who say that this was a segregating, colonial school.” One example he presented was the National Organization of South African Students (which was a “white, but a progressive-liberal organization”), complained about the hypocrisy of the institution, questioning the need to separate African students from the rest of society. The Soviet reply was that segregation was not the intention, an accurate statement in Katsakioris’ view, whose argument is that the University was rather created as a cultural policy, “something that would elicit the gratitude of the South.” The Arab states’ complaints in turn had to do with “hierarchies,” such as the presence of African students, whose low levels of education, they argued, would hurt their own students (for instance, “Tunisian students whose levels were comparable to European students.”) The most common reaction a state could take against the Lumumba University was not to recognize the degree. Katsakioris’ research then turns to the Soviet response to the problems of the 1960s and 70s, once it became clear the University was not functioning very well. A new director, appointed in 1970, prepared a report to address the problems, which Katsakioris’ found in the archives: “They would have to adjust the level of studies to the Soviet standards, select qualified candidates who have completed their secondary education, work closely with communist parties and governments for selection of students and recognition of degrees, increase the number of Soviet students and make training mandatory for students.” These propositions were accepted, which meant a new era for Lumumba University following the “experimental period” of the 1960s. From mid-1970s to 1989, Katsakioris said, there were many academic improvements, and as a result UDN became “a very different university.” Ultimately, however, “this meant that from the 1970s onward, the University had no more reason to exist.” Once Khrushchev’s ideas were abandoned, “it had become a normal, regular Soviet university,” Katsakioris found. In 1989, the University introduced fees, and in 1991 signed an agreement that would enable it to enroll students from Russia’s minority regions as well as CIS countries. There was a dramatic deterioration in the academic level, Katsakioris, and the most recent news-event associated with the University was the tragedy in 2003 when 43 African and Asian students died in a fire in the dormitory. In the Q&A session that followed, Rossen Djagalov, Assistant Professor of Russian and Slavic Studies at NYU, asked Katsakioris about the setting of his story, namely the debates on education immediately following decolonization, and if he found “any traces of the Soviet experience of educating students from the colonial realm of the 1920s and 30s, or any references to that early Soviet experience in the official discourse surrounding the UDN’s establishment.” Katsakioris explained that in fact that reference was consciously avoided. Instead, “the reference is robochie fakulteti, not political schools. This story is different, it’s a normal educational cooperation,” he said. Participants also probed Katsakioris on his differentiation between UDN as an educational and cultural project, and the extent to which indoctrination was truly part of the experience. Related to that was the question of how the success and failure of the project could be determined. Asked if the Soviets wanted to relay the idea that this wasn’t a political project, Katsakioris reiterated that the objective was never to “turn students into communists,” but rather the UDN was “presented as a university in solidarity with people oppressed by colonialism.” The Soviets state was conscious of its own image in the Third World, which is why for a long time ideological courses were optional. On the other hand, as Yanni Kotsonis suggested, when one studied in a socialist country such as the Soviet Union, chances of indoctrination were very high by default. Jane Burbank, Professor of History and Russian & Slavic Studies at NYU, suggested a similar interpretation, where success of the project is not necessarily measured from the state’s political perspective, but students’ immersion in and sympathy for Russian/Soviet culture is taken into account.